Ever wondered what it feels like to win a prestigious national scholarship? Just ask political science junior Daniela Estrada, who recently learned she’s one of 54 students nationwide to be named 2016 Truman Scholars. The extremely competitive Truman Scholarship, established by Congress in 1975 and administered by the Harry S. Truman Scholarship Foundation, is considered the nation’s highest honor for college juniors who demonstrate leadership potential and a commitment to a future career in public service. For Estrada, that commitment revolves around the courtroom. She dreams of one day representing underprivileged individuals charged with crimes as a public defender, and the Truman Scholarship provides $30,000 for graduate school. But the honor means more to her than just personal opportunity – it means she’s that much closer to changing perceptions about a widely derided profession. Consider how mainstream media portrays public defenders: In the 1992 film “My Cousin Vinny,” a bumbling and incompetent public defender is appointed to represent two students in a murder trial, who – after seeing him perform horribly in court – resort to hiring their eccentric cousin instead. Estrada argues that, in reality, this negative stigma is largely the result of systemic failures rather than poor lawyering. According to Estrada, who did extensive research on the subject for the policy proposal she submitted as part of her scholarship application, public defenders are bogged down by unmanageable caseloads, are paid low salaries and often don’t have enough investigators to assist them. The biggest change Estrada would like to see is a fixed number of cases allotted to each attorney, which she believes would greatly improve the system. It’s clearly a topic close to her heart, as is public service in general. 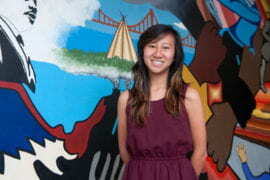 In fact, Estrada has dedicated much of her free time in college to groups that aid low-income and first-generation students. And with good reason: Her parents are both immigrants from low-income backgrounds, and she has benefited firsthand from such support. 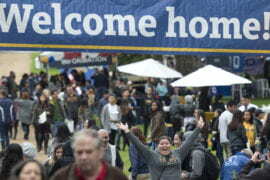 For now, Estrada is focused on inspiring and educating her peers and younger students through programs such as UCI’s SAGE Scholars, which she says was a tremendous aid to her when she first arrived here. She notes that first-generation students often have no guidance when it comes to opportunities on campus and how to build a strong resume, and SAGE – which stands for Student Achievement Guided by Experience – offers that support and more. Estrada also volunteers as a teaching assistant with UCI’s Saturday Academy of Law, which exposes local at-risk youth to the legal profession. By educating and guiding them, Estrada hopes to have an impact on such students and, in the future, with the help of the Truman Scholarship, in the public defense field. Her next step toward that end will be a summer internship at the Washington, D.C., public defender’s office. It’s known as one of the best in the nation, Estrada says, and the experience will show her what a well-run agency looks like. She’s also looking forward to seeing what client interaction looks like behind the scenes and learning the ins and outs of trial preparation, since she has already observed trials through her recent internship with the Orange County district attorney’s office. A prospective public defender working with the D.A. may seem contradictory, but in fact, Estrada says, her time there – while invaluable – only strengthened her desire to be on the other side of the courtroom. Estrada credits UCI sociology professor David Meyer for instilling the notion in her that yes, change is possible. Estrada is also adamant that she wouldn’t be on the trajectory she is without the assistance of her mentor, Mark Petracca, associate dean of social sciences. After being notified of her Truman Scholarship, she called her family, but he was the very next person she wanted to inform. Aside from nominating Estrada for the scholarship, Petracca has helped her conduct research (which she was able to get funded), a skill that will be vital in her future work. It seems that Estrada has taken advantage of every resource available at UCI, an approach she recommends to students like her. And what advice would she give those seeking careers in public service? Daniela Estrada is UCI’s eighth Truman Scholar, following most recently behind Felipe Hernandez ’13, who received the scholarship in 2012. Nationwide, there were 775 applications for the 54 2016 awards. 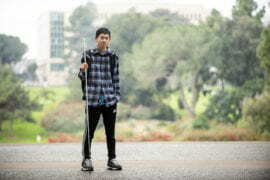 Among the 197 finalists was another UCI undergraduate, marking the first time the campus has had two students reach this round of review in the same year. 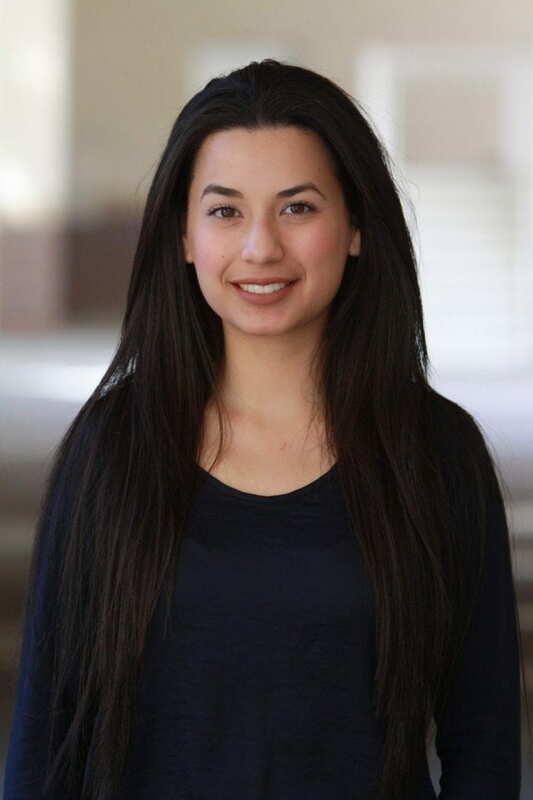 Estrada was the only University of California student – and one of only two Californians – to be named a 2016 Truman Scholar. In addition to funding for graduate study, winners receive priority at premier graduate institutions, leadership training, career and graduate school counseling, and special internship opportunities within the federal government. Awardees must be U.S. citizens, have outstanding leadership potential and communication skills, be in the top quarter of their class, and plan to work in government or the not-for-profit sector. Prospective UCI candidates submit applications to the campus’s Scholarship Opportunities Program, which helps undergraduates obtain prestigious merit scholarships requiring university endorsement.